Installed 03 Jun 2008 - latest Update 08 Sep 20715. In 1963 Donald R. Barber, who had just retired as Superintendent of the Norman Lockyer Observatory at Sidmouth England, published a paper titled "Invasion by Washing Water. "(1) In the paper he speculated that a hitherto unidentified strain of bacteria was periodically being transported from the atmosphere of the planet Venus to earth and reached the earth's surface in rainwater. The invasions (with one perhaps explainable exception) occurred when Venus was near an inferior conjunction with earth. Geomagnetic storms were also a requirement for the invasions, and of course, rain!. Microscopically, the unknown bacteria were similar in appearance to Bacillus (Psuedonomas) fluorescens liquefaciens. They differed from that strain in that they were an extremely rapid liquefier of the gel emulsions used for astronomical photographs and were highly tolerant of the silver salts suspended in the gels. (Silver salts are normally deadly to most bacteria.) The bacteria were also highly fluorescent in ultraviolet. I have started some experiments to sample rainwater, leading up to the time of the next inferior conjunction of Venus on about 29 Mar 2009. I hope to find some typical patterm of bacterial activity and then see if something out of the ordinary (bacteria-wise) occurs near the time of the inferior conjunction. This first experiment with rainwater bacteria uses non-fat milk as a nutrient medium. 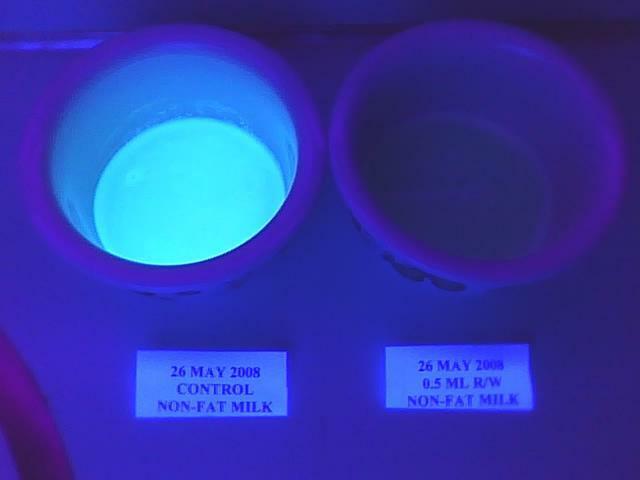 Milk fluoresces bluish white when excited by ultraviolet light. 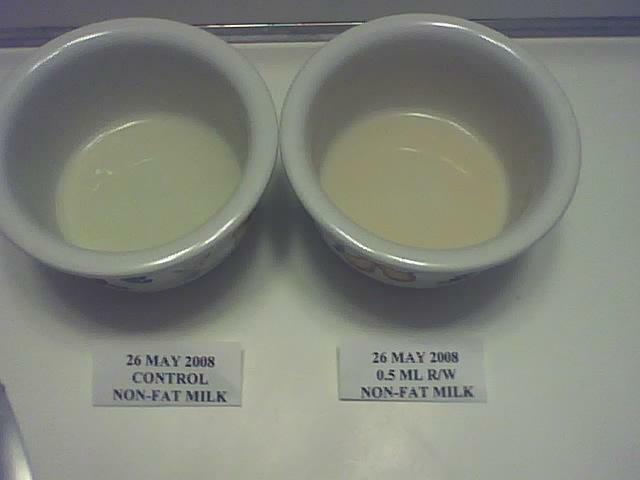 This experiment shows what effect rainwater (with unidentified bacteria) has on the fluorecence properties of the milk. The rainwater sample was obtained on 26 May 2008 at Starkville, Mississippi. I sterilized two custard bowls (called "containers" below) (300 degrees F for ten minutes) and then cooled them down to about 120 degrees F prior to pouring about a 1/8th inch deep puddle of milk in each container. After this, the tops of the containers were sealed with aluminium foil to minimize contamination from airborne bacteria, and then they were heated to about 200 degrees F for ten minutes to pasteurize the milk puddles. 0.5 ml of rainwater was injected with a hypodermic syringe through the aluminum covering of one container and the puncture hole was sealed with tape. 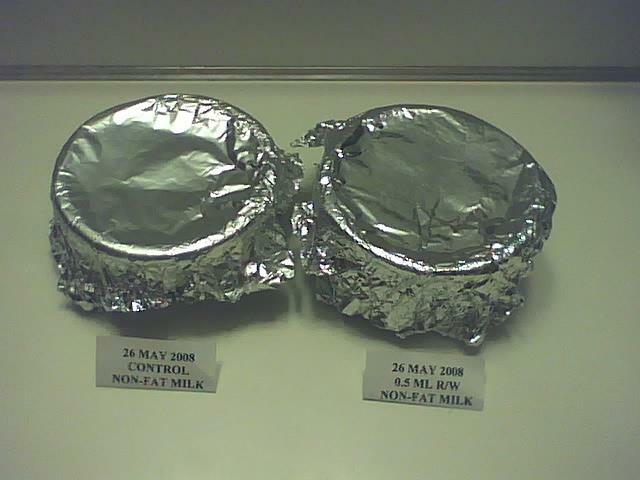 After 24 hours the aluminum foil covers were briefly removed from each container and the milk fluorescence was checked. (Lots of other things, stumblings and bumblings, went on too.) The milk puddles were nearly identical with regard to fluoresence levels. The fluorescence of the rainwater dosed milk continued to decrease with time. 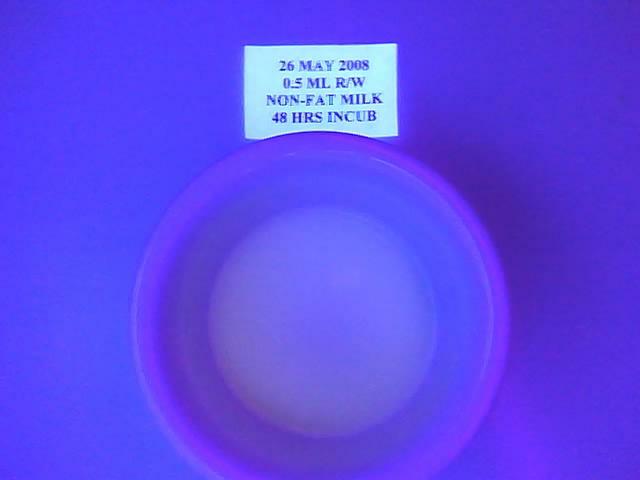 The following photograph, using visible light (energy saving fluorscents) for illumination, was taken after one week of incubation at room temperature. The control sample is on the left, and the rainwater dosed sample is on the right. Note that the rainwater sample has a slightly brownish color compared to the control sample. 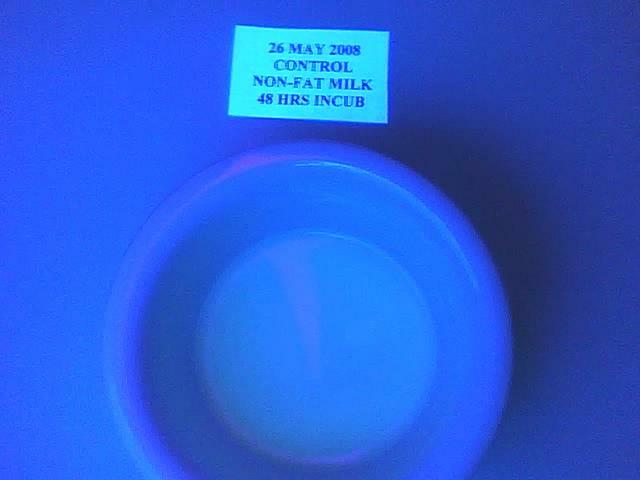 The following photograph, with black light for illumination, was also taken after one week of incubation at room temperature. The control sample is on the left, and the rainwater dosed sample is on the right. Something has practically eliminated the fluorescence in the rainwater dosed sample. (1) D.R. Barber, "Invasion by Washing Water," Perspective, 5, 201, (1963).